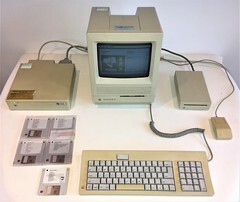 Macintosh SE/30 in full original working order, very good used condition with accessories (all accessories working except external floppy drive). Macintosh SE/30, Model Number M5119, full original working order (not refurb.) With no floppy in the drive it boots automatically to AppleShare server (admin password not known). With the System Start floppy disk in the drive it boots to standard desktop. Bought by my uncle from Edinburgh University where he was a lecturer, has sticker from original vendor Scotbyte + old PAT test sticker. I think this was originally used as a training server for students. Cobra 210e (Rodime Systems, made in USA). 200,000 kB disk. Full working order, reformatted ready for sale. Has an Edinburgh University fault reporting card attached (possible historical interest) + old PAT test sticker. Apple Desktop Bus Mouse, Family Number G5431 E89826T LR66731. Full working order. Apple Keyboard, Model Number MO116. Full working order. Apple 800K External Drive, Model Number MO131a. NOT WORKING - disk drive loads/ejects disks and is recognised by the computer, but known good disks cannot be read giving error "This disk is unreadable: Do you want to initialize it?" System Startup disk in original packaging. Computer can read disk and display folder contents. Welcome disk in original packaging. Computer can read disk (displays as Macintosh Basics) and display folder contents. System Additions disk in original packaging. Computer can read disk and display folder contents. HyperCard disk in original packaging. Computer can read disk and display folder contents. Install 1 disk, no packaging. Found in floppy drive when acquired computer. Computer can read disk and display folder contents, but I don't think this is a useful disk.This may be Disk 1 of a set for installing an operating system, but I don't have any of the other disks.